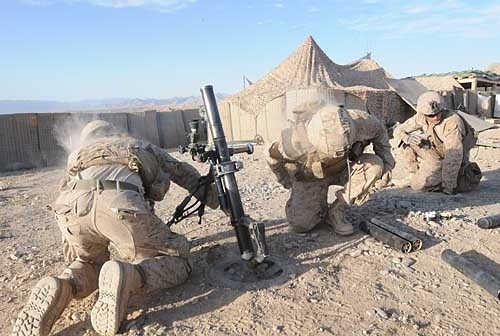 Lance Cpls Marcus Blalock (left) and Carlos Esposito register the 60mm mortar system at Observation Post Shrine. Second Platoon Alpha Co, 1st Ballion, 8th Marines man Observation Post “Shrine” along with elements of the Afghan National Army at the northernmost frontier of the Marine area of operations in Helmand province. OP Shrine in Kajaki, Afghanistan on April 12, 2012.